The Marco Polo, a 3-masted medium clipper ship, was built by the Smith Ship Builders of Saint John, New Brunswick and launched in 1851. The ship had 3 complete decks, measured 184′-0″ x 36′-3″ and weighed 1,625 tons. She was sold to the Black Ball Line of England in 1852 and refitted as a passenger ship for the Australian immigrant trade. Captained by James (Bully) Forbes, the Marco Polo set world records for the fastest trip from Liverpool to Melbourne – a voyage completed in 76 days. She was retired from passenger service in 1867; seventy-five percent of the people living in Australia can trace at least one ancestor who emigrated on this ship. The ship was then refitted and used in the coal and timber trade. 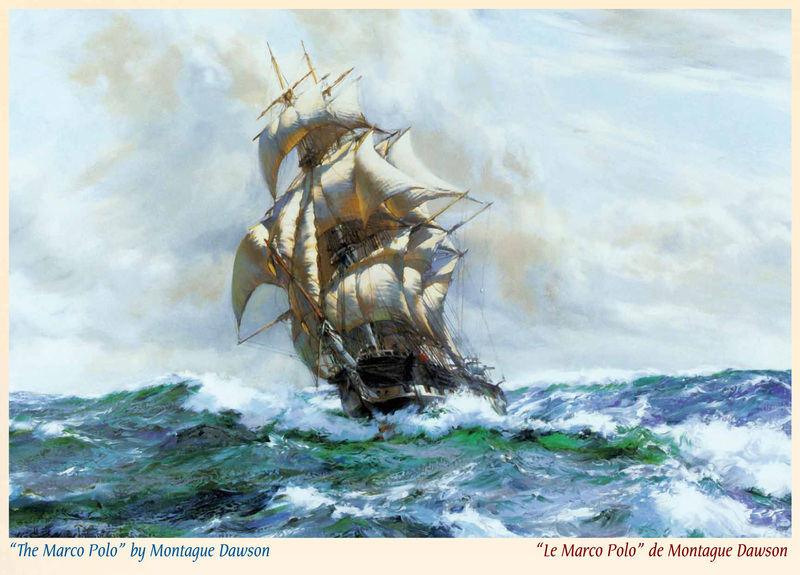 In July of 1883 on a voyage from Montreal to England and loaded with pine deals (plank) the Marco Polo was caught in a severe storm in the Gulf of St. Lawrence and began to leak. After two days and as the storm reached its peak the crew were unable to hold back the water. Captain Bull decided to run the ship ashore to save the crew and cargo. He chose the sandy beach off Cavendish so the vessel would not be smashed on the rocks. He put the ship in full sail to achieve maximum speed and as they came ashore ordered the crew to cut the rigging causing the masts to snap, leaving them firmly grounded 300 feet from land. They had to wait through the night as the storm raged and in the morning when the winds abated made it safely to shore. In the weeks that followed as much as possible was salvaged and sold at an auction held at Alexander MacNeills. Many relics from this wreck can still be found in the homesteads of Cavendish.